The Nobel Laureate gave the #LiNo17 opening lecture with the title ‘The Joy of Discovery’. Ben Feringa grew up on a farm near Groningen, the second of ten siblings. Today, he is professor in Groningen and also received his MSc and PhD degrees there. And just as much as he enjoyed nature as a child, he now enjoys the inifinite possibilities of molecules. In his own words: “We enjoy the adventure into the unkown.” Before starting his lecture, he has some advice in store for the young scientists at the Lindau Nobel Laureate Meeting: Always look for a challenge, and find teachers who challenge you, persevere, follow your intuition and your dreams – but ‘walk on two feet’, meaning remain realistic, and find a balance between life and research. Looking at his impressive career, and appreciating his obvious delight in his work, it seems that Feringa took his own advice to heart. It’s truly mind-blowing to see what Ben Feringa and his research group are capable of: they synthesise molecules from inanimate matter that can move autonomously. One striking example are the small ‘spiders’ that you can see crawling around under a microscope. These ‘spiders’ can self-assemble, meaning that several molecules form clusters, and these clusters move completely autonomously as long as ‘fuel’ is provided, in their case sugar. (You can watch the crawling ‘spiders’ in a solution, also called nano-swimmers, on the website of Feringa’s research group, or at the end of his #LiNo17 lecture). Other molecules at Feringa’s Molecular Nanoscience group at the University of Groningen have been fitted with light-sensitive switches, so light of a certain wavelength turns them on and off and also acts as their ‘fuel’. Finally, the researchers managed a full rotation with two double-bond isomerisations and two helix inversions induced by heat (see graph above). On the one hand, ‘unidirectional rotation marks the most fundamental breakthrough‘ in the search for molecular motors; on the other hand, the molecule was still too slow – it needed about one hour for the 360 degree turn. Now the researchers set out to build much faster molecules. About sixty different motor designs later, they reached an astounding speed of 10 million rotations per second. But in reality there are some restrictions: for instance, you often cannot get enough energy into these nanosystems to perform at top speed, and the surfaces on which the motors are supposed to perform limit their speed. So realistically, these tiny motors now rotate at about 4000 cycles per second. Next, the researchers fitted four of the enhanced molecules on to axles and added a stator: a molecular four-wheel drive was put on the ‘road’, usually a metal surface. Today, several research groups around the world build nanocars. And although Feringa’s team received much recognition for their own nanocar, they’re exploring many other possible applications of molecular machines, for instance in medicine: imagine smart drugs that can be ‘switched on’ only at their target area, for instance a tumour. These would be high-precision drugs with very few or even no side-effects, because other body cells would not be affected. 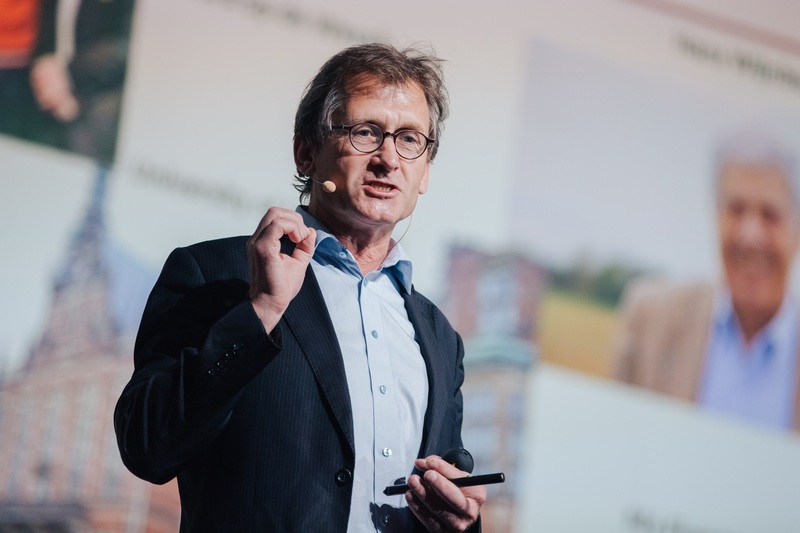 In his Lindau lecture, as well as in his Nobel lecture in Stockholm in December 2016, Feringa gave two prominent examples: photo-controlled antibiotics and photo-controlled chemotherapeutics. Into one drug from each category, the Feringa group inserted a light-switch, meaning that the drugs only start working if they’re activated by a certain wavelength of light. The researchers are now working with near-infrared light that has a deep penetration depth, meaning it can even reach remote places deep inside the human body. With photo-controlled antibiotics, the goal is to ‘train’ the molecules to find their target structures autonomously. Next, their activity would be switched on with an infrared light. Now the drugs would work against a bacterial infection at the target point – no other body cells or bacteria would be affected, making antibiotic restistance more unlikely. And even if the drug leaves the body after treatment, contamination of ground or drinking water would be prevented by precisely engineered half-times of the molecules: they would simply stop being active after a certain amount of time, rendering the build-up of antibiotic restistance outside the human body unlikely as well. The same holds true for chemotherapeutics: only after a photo-controlled chemotherapeutic reached a tumour, its activity would be switched on, meaning all other body cells would be spared the often severe side-effects. In his Nobel lecture, Feringa describes his dream for future cancer treatments: new imaging technologies like MRI would be linked to a specific laser. First, the patient receives an injection of a photo-controlled chemotherapeutic. Next, the MRI technology would detect a tiny tumour. Now the MRI feeds this information automaticaly to a laser that is callibrated to a specific wavelength that activates the drug. The result is “high temporal and local precision”. Those are only two examples of the ‘endless opportunities’ of molecular machines, in Feringa’s words – and applications are not limited to pharmaceuticals. Feringa himself talks about self-healing car coatings or wall paint, also called ‘smart coatings’. With a growing world population and a scarcity of materials, smart coatings could help to form longterm coatings, help to spare natural resources, or they could integrate information technology like sensors into the coatings. Other experts envision self-healing infrastructure, for instance plastic water pipes that are able to repair their own leaks. Fraser Stoddart, Feringa’s American-Scottish co-recipient of the 2016 Noble Prize, went into yet another research direction and now builds highly efficient data storage devices based on molecular machines. 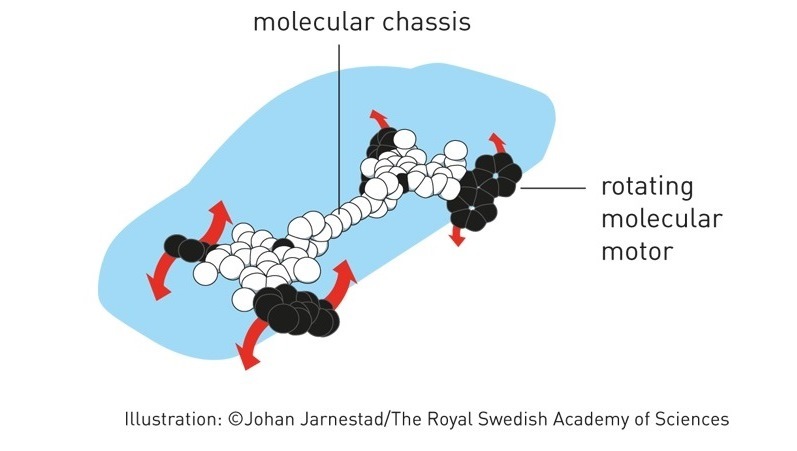 In October 2016, the Royal Swedish Academy of Sciences announced “the dawn of a new industrial revolution of the twenty-first century” based on molecular machines. 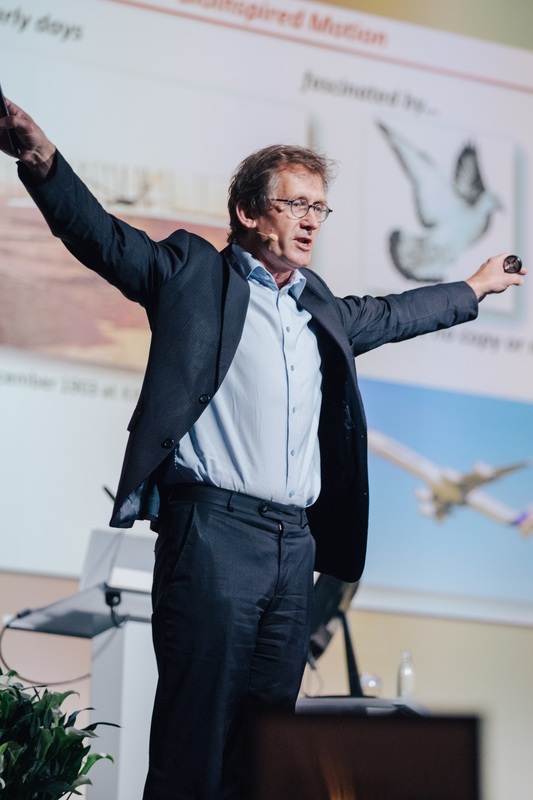 Feringa himself often emphasises that he is conducting basic research, and he likes to point out that inventions like electric machines, airplanes or smartphones where all the results of basic research – and that they often needed several years or decades to find widespread application. He estimates that in maybe fifty years, doctors will be able to use photo-controlled drugs as described in his Nobel lecture. Jean-Pierre Sauvage, Feringa’s French co-recipient, presented his lecture ‘From Chemical Topology to Molecular Machines’ on Thursday, 29 June. 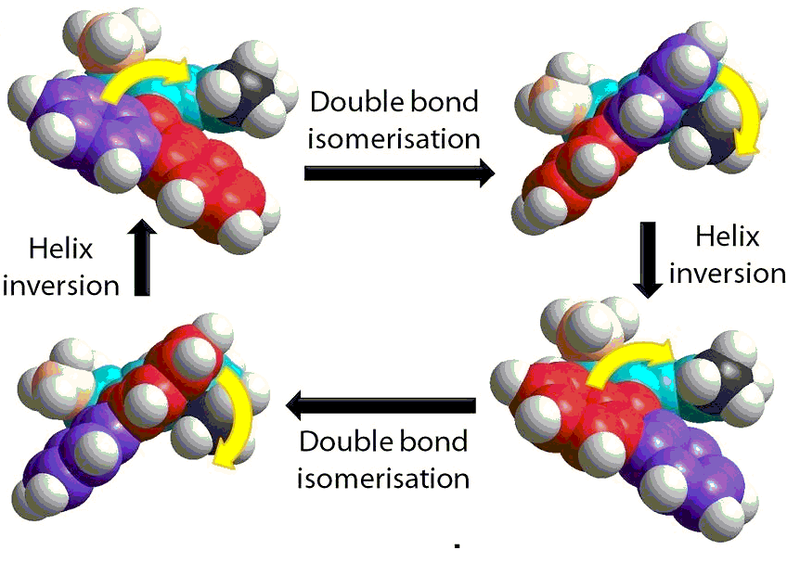 He explained the ‘catenane’, a molecule he invented, which consists of two interlocking rings.